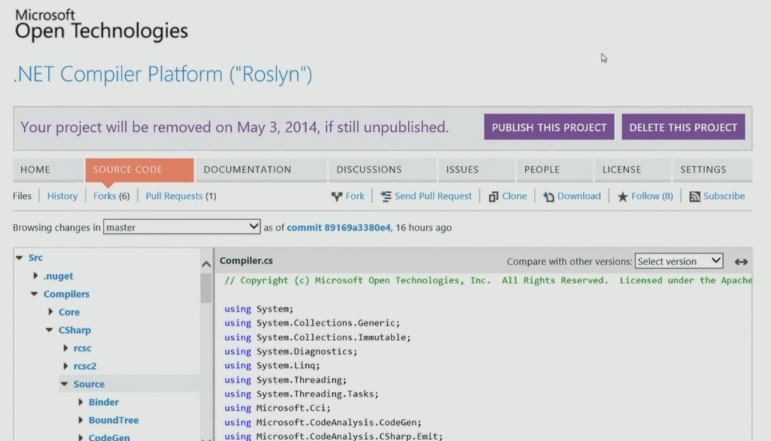 Last week, Microsoft open sourced Roslyn, the .NET Compiler Platform for C# and VB. Roslyn is an effort to create a new generation of compilers written in managed code. In addition to the standard batch compiler, it contains a compiler API that can be used by all kinds of tools that want to understand and manipulate C# source code. Roslyn is the foundation that powers the new smarts in Visual Studio and can also be used for static analysis, code refactoring or even to smartly navigate your source code. It is a great foundation that tool developers will be able to build on. I had the honor of sharing the stage with Anders Hejlsberg when he published the source code, and showed both Roslyn working on a Mac with Mono, as well as showing the very same patch that he demoed on stage running on Mono. At BUILD, we showed Roslyn running on Mono. If you want to run your own copy of Roslyn today, you need to use both a fresh version of Mono, and apply a handful of patches to Roslyn . The source code as released contains some C# 6.0 features so the patches add a bootstrapping phase, allowing Roslyn to be built with a C# 5.0 compiler from sources. There are also a couple of patches to deal with paths (Windows vs Unix paths) as well as a Unix Makefile to build the result. Sadly, Roslyn's build script depends on a number of features of MSBuild that neither Mono or MonoDevelop/XamarinStudio support currently , but we hope we can address in the future. For now, we will have to maintain a Makefile-based system to use Roslyn. Our patches no longer apply to the tip of Roslyn master, as Roslyn is under very active development. We will be updating the patches and track Roslyn master on our fork moving forward. 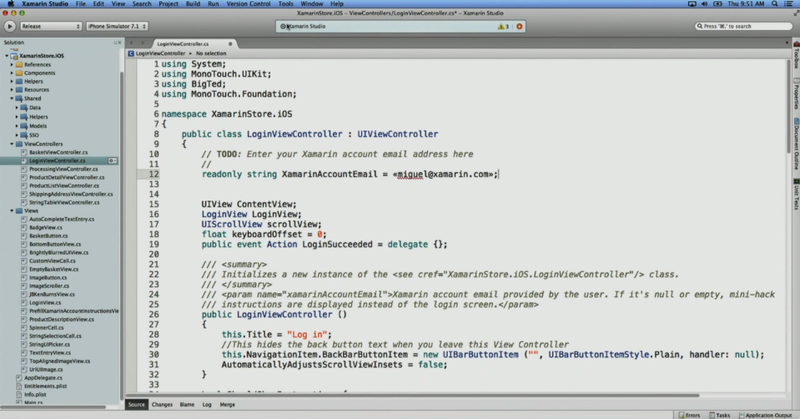 Currently Roslyn generates debug information using a Visual Studio native library. So the /debug switch does not work. We will be providing an alternative implementation that uses Mono's symbol writer. Our goal is to keep track of Roslyn as it is being developed, and when it is officially released, to bundle Roslyn's compilers with Mono . But in addition, this will provide an up-to-date and compliant Visual Basic.NET compiler to Unix platforms. Our plans currently are to keep both compilers around, and we will implement the various C# 6.0 features into Mono's C# compiler. There are a couple of reasons for this. Our batch compiler has been fine tuned over the years, and for day-to-day compilation it is currently faster than the Roslyn compiler. The second one is that our compiler powers our Interactive C# Shell and we are about to launch something very interesting with it. This functionality is not currently available on the open sourced Roslyn stack. In addition, we plan on distributing the various Roslyn assemblies to Mono users, so they can build their own tools on top of Roslyn out of the box. Roslyn really shines for use in IDEs. We have started an effort to adopt Roslyn in MonoDevelop/Xamarin Studio. This means that the underlying NRefactory engine will also adopt Roslyn. This is going to be a gradual process, and during the migration the goal is to keep using both Mono's C# compiler as a service engine and bit by bit, replace with the Roslyn components. We are evaluating various areas where Roslyn will have a positive impact. The plan is to start with code completion  and later on, support the full spectrum of features that NRefactory provides (from refactoring to code generation). While not related to Roslyn, I figured it was time to share this. For the last couple of months, the ECMA C# committee has been working on updating the spec to reflect C# 5. And this time around, the spec benefits from having two independent compiler implementations. Our goal is to contribute fixes to the Roslyn team to make sure that Roslyn works great on Unix systems, and hopefully to provide bug reports and bug fixes as time goes by. We are very excited about the release of Roslyn, it is an amazing piece of technology and one of the most sophisticated compiler designs available. A great place to learn great C# idioms and best practices , and a great foundation for great tooling for C# and VB. Thanks to everyone at Microsoft that made this possible, and thanks to everyone on the Roslyn team for starting, contributing and delivering such an ambitious project. Roslyn uses a few tracing APIs that were not available on Mono, so you must use a newer version of Mono to build Roslyn. This is a problem because our project system tries to load project references verbatim from the project file, instead of evaluating them from the MSBuild engine. This would be fixed by one of the MSBuild integration improvements I've proposed. There's an InvalidProjectFileException error from the xbuild engine when loading one of the targets files that's imported by several of the code analysis projects, VSL.Settings.targets. I'm pretty sure this is because it uses MSBuild property functions, an MSBuild 4.0 feature that xbuild does not support. They use the AllowNonModulatedReference metadata on some references and it's completely undocumented, so I have no idea what it does and what problems might be caused by not handling it in xbuild. One project can't be opened because it's a VS Extension project. I've added the GUID and name to our list of known project types so we show a more useful error message. A few of the projects depend on Microsoft.Build.dll, and Mono does not have a working implementation of it yet. They also reference other MSBuild assemblies which I know we have not finished. Since Roslyn is much better at error recovery and has a much more comprehensive support for code completion than Mono's C# compiler does. It also has much better support for dealing with incremental changes than we do. Modulo private. They use private everywhere, and that is just plain ugly. We will find out a way of selecting which compiler to use, either mcs (Mono's C# Compiler) or Roslyn.